This time around, the series has enlisted E.L. Katz as the season’s director, who puts a noticeable ‘80s slasher film spin on things. Katz is perhaps best known for directing the unsettling dark comedy Cheap Thrills, with Pat Healy, David Koechner, and Ethan Embry, and he applies a similarly graphic aesthetic to the story of newlyweds Jillian (Maria Sten) and Tom (Brandon Scott), who discover their house (which happens to be Tom’s childhood home) has a mysterious blue door in the basement that was never there before. The couple, along with Tom’s friend Jason (Nicholas Tucci) struggle for hours to open the door only to find it leads down a large staircase to a second door they cannot seem to open. After a period of time, Jillian finally succeeds in opening the door, unwittingly unleashing a clown-faced being known as Pretzel Jack. Antosca: It’s a much more romantic season. That’s one thing we’ve never done before, and that was something that was really interesting to me to explore. I feel like when we get into relationships we take a huge leap of faith. We make ourselves really vulnerable, and it’s a scary thing. That’s something that horror can explore very well. It doesn’t necessarily always do it, but some of the great horror films that we know and love do. Rosemary’s Baby, for example, is really about trust and infidelity, and I wanted to take the show in that direction. What Troy [James, the actor who plays Pretzel Jack] can do with his body is just insane, and there was no other contortionist that sent their stuff in that was as good. He was the best. There’s something about Troy where he does love horror and he’s well versed in it, but he’s just a sweet guy. He’s really sweet, he’s really innocent, he’s really playful. So even though he can move his body around in this way that maybe can freak people out, there’s just such joy in him. I was like, “Okay, he’s obviously Pretzel Jack.” Because as you get to know [the character] better, eventually he does become that little kid’s best friend character in a genuine way. It was just clear that Troy was able to do that. To editorialize for a moment: In my opinion, Channel Zero is the most exciting and adventurous horror show on TV, and in a just world, it would enjoy the mainstream adulation that Haunting of Hill House (deservedly) received. Like Hill House, every season's horrors are rooted in family trauma and dysfunction. And every season, the monsters are not interloping alien outsiders, but parts of ourselves, parts of our family, parts of the family we wish we had. 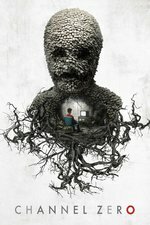 Channel Zero traffics in horror that is both modern and mature, and deserves more recognition. Also, it's quite a feat when the monster that terrified you silly in the first episode can elicit joyful tears just by reappearing in the last episode. Here's Troy James, the actor who plays Pretzel Jack, on America's Got Talent demonstrating early on how he can be simultaneously terrifying and adorable. I haven't seen any of the other seasons but I got sucked into this one. It was imaginative, spooky and affecting, but I'd disagree with Antosca that horror is more effective in broad daylight. There was a surreal humor to seeing some of this stuff in the sun but it also made me a little too aware that I was watching people run around in goofy costumes. (I remember similar moments in the original TV version of It, where Pennywise shows up on a sunny suburban street and all of a sudden it's just Tim Curry making funny faces in a clown suit. Monsters are for night time!) In the final episode, when Pretzel Jack got out of the sun and went back to lurking around the shadowy house, he struck me as much more in his element. He was a natural lurker. After everything they'd been through it was nice to see the couple have a happy ending, but I thought the twist with the daughter being a door-maker was too obvious. This story was full of all kinds of wild twists, and then that ending was just about the most predictable one this story could have! It didn't ruin the whole thing for me, but it was like watching them run an impressive race and then stumble just as they crossed the finish line. Well now I have to watch this. There were 2 or 3 points in this season where I was sure the show was about to lose me, but it never did...It just kept changing, to the point that at about halfway through it I didn't really find it all that creepy or scary anymore, but I was still very much invested. I think this is my favorite of the seasons so far. I love Pretzel Jack. I've been looking for where I read either Nick Antosca or E.L. Katz describe him as a creepy villain who you come to see as a Pixar character, but that was basically how I experienced him...Like if Bing-Bong from Inside Out was real and ready to brutally murder anyone that you don't like. I was pleasantly surprised by this season, and it made me go back and binge out on seasons two and three while I was laid up last weekend - I originally started to watch the first season, but it never quite got me, because I'm sorry, but puppets just aren't remotely scary. (You heard me, Thomas Ligotti.) I thought season 2 made an admirable and unpredictable jump into crazy high-concept sci-fi territory, and season 3 turned into a kind of low-budget latter-period Clive Barker story, with some Candyman themes sprinkled in. In comparison, season 4 wound up seeming slightly more "normal" in that by the end it eased back into regular horror tropes. I thought the last episode in particular was one of the weakest, devolving into a monster chase without a particularly terrifying monster. Still, the show was packed with unpredictable moments, like the half-formed rabbit and the sudden stabbing death of the best friend, and I felt like the cinematography and acting on display were punching well above their weight. I especially liked the rotating overhead shot of Pretzel Jack strangling Tom in the hot tub (or whatever that was). It was a little more thematically rich than average for a horror show, too, with Jillian's original trauma about her dad having two families mirrored in her husband's also having two families, or thinking he did. This was good enough that I'm going to go back and watch some other seasons. I washed out of season one and never got back into it. But this season was good. It's still low budget and lacks the electric style or bolder ambitions of something like Hill House, but it knows its sweet spot and operated well within it. I admired the focus on scaring you in broad daylight with things that Should Not Be, rather than jumping out from the dark with jump scares. This reminded me of all the things I liked about Season 2: No End House, but I preferred that to this one, actually. Almost like these seasons were related in an inverse way to each other. Pretzel Jack could easily be one of the memories feasted upon in the No End House. Meanwhile, the Devoted Dad could easily be another Dream Door crayon villain. I haven't seen the latest season yet, but will based on what I'm reading here. When someone tells me they want to see something legitimately dark and scary, I always point them towards this show.